Getting an A-list celebrity to endorse your products, without paying an extortionate fee, was an inspired marketing ploy dreamt up by Daniel Price to promote his range of personalised baby clothing. 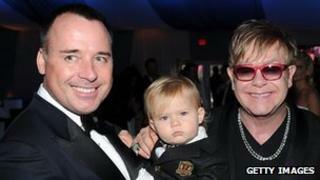 "My mother told me a radio station was looking for the perfect baby gift to give to Elton John and his partner David Furnish, who were being interviewed a week later," he says. Together with his business partner, he created a gift hamper, including a blanket embroidered with the slogan: Zachary - how wonderful life is now you're in the world. "Not only did we get on-air promotion, certain magazines mentioned it and our business immediately stepped up another level," says Mr Price. It was an innovative technique they had previously employed with the singer and X Factor judge Dannii Minogue. "When she had her baby we sent a blanket with 'Mummy's got the X factor' embroidered on it and she then started tweeting about it," he says. "I also rang the prime minister's press office and told them I was a family friend dropping off a baby gift. They took my name and the registration number of the car and we were able to drive right up to Number 10 to deliver it in person," he grins. They received a pleasant thank-you note from David Cameron, but things really heated up when they offered David and Victoria Beckham's nine-month-old daughter a modelling contract. They also released the offer to various media outlets. When a representative of the Beckhams went on television in the US to state that they "would never consider doing this," they gained the kind of exposure for which established companies pay serious money. It hadn't always been so easy. For the first 18 months they relied on family and friends for everyday living expenses. He started the venture My1stYears with Jonny Sitton, whom he'd known since primary school. It began when Mr Price read an article three years ago, stating that 880,000 babies were going to be born the following year. "I thought that was a big market, and that shoes personalised for babies could be a nice gift," he explains. That was when he turned to his friend and said: "Don't be an accountant, we are going to work for ourselves." Lounging back on a sofa above a converted garage in the grounds of a substantial property in London's leafy suburb of Mill Hill, the pair reflect on how far they have come since their days at Leeds University. "I began selling clothes and jewellery to students," says Mr Price, before he progressed to arranging student events seven nights a week. He still managed to get his degree, as did Mr Sitton, who'd started importing ink cartridges from China to sell on eBay. Nobody was able to embroider on anything as small as a baby's shoe so they bought their own machine and set up their own workshop in a tiny office. "Jonny would do the embroidering and I would do the packing. We celebrated every time we got an order," Mr Price chuckles. They eventually found someone to do the embroidery for them and now employ three machinists. Although shoes remain the company's unique selling point, they have added more clothes and accessories for the baby market. Research shows that on average, 12 people buy a new baby a present. "Despite the financial downturn people will not stop buying but we have to offer cheaper products as well," Mr Sitton points out. Sales figures have been increasing 14% month-on-month since the beginning of the year. Despite being very conscious of their profit margins, they are prepared to pay a bit more for the materials to ensure the quality. "When we started, we looked for the cheapest prices and they were in China and India," says Mr Sitton. "Now, with orders in the thousands, we don't want to take big risks, especially after we found the quality was not consistent," he says. Most of the products are manufactured in the UK or Turkey. He frequently visits the factories to ensure they follow the standard and ethics they insist upon. "People are prepared to pay a premium for quality products and there is also a better re-order rate," he adds. The latest steps in the remarkable progress of these two 25-year-olds, is signing a contract with Interflora - the flower delivery company. "People can order a gift for the baby while buying flowers for the mother, and have it delivered the next day," Mr Price says. More recently they have come to an arrangement with John Lewis and have attracted a wealthy investor who made his fortune in the retail business. One gets the impression that these ambitious young entrepreneurs could sell ice-cream in the Antarctic and they are planning to launch in the US later in the year. "People say we must be proud of what we are doing but, until we get to 28 and have made our first million, we just get on with it," Mr Price quips. Why the middle name Seven?